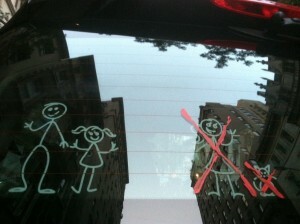 I saw this homemade stick figure appliqué on the rear window of a car in Manhattan last summer. The great divide of a family can take on many dynamics. The biggest of all the lessons is the teaching moment to the children. The “mom got the cat and I got the kid” drawing is hard enough to look at, let alone drawing big red X’s for the child to witness adds another level of challenge. Riding for an awareness of issues that kids are having to deal with at far too young an age has been a conversation starter of all types, enabling me to help in challenges individuals are having. My hope from this drawing is that the child is being told by the parents that both parents love her. This entry was posted on Saturday, June 29th, 2013 at 10:16 am	and is filed under Kindness. You can follow any responses to this entry through the RSS 2.0 feed. You can leave a response, or trackback from your own site.